What is Intrinsic Stock Value? by Jim Walker on Thursday, August 2nd, 2012 | Comments Off on What is Intrinsic Stock Value? Intrinsic stock value is a concept that emerged from the carnage of the 1929 to 1932 stock market crash. It is a way to invest rationally as opposed to investing by guess work, which is closer to gambling. To get a sense of the way this concept changed the face of investing we need to go back to an era where investing in the stock market really did resemble gambling at the casino. A common expression during the steady rise of the American stock market in the roaring twenties was to “play the stock market.” Many people believed that one only needed to pick a stock and wait for it to become more valuable. It seemed that no matter what stock a person bought, they were making money by “playing the stock market.” It was a much better deal than going to the casino because at the casino there was a much greater chance of losing your money. All of that lasted until 1929 when the stock market crash started from Black Thursday (October 24) to Black Tuesday (October 28). The Dow Jones Industrial Average began the 1920’s at 100 and peaked in 1929 at 381.17. It then lost nearly half its value down to 198.69 in the 1929 crash. (Dow Jones history 1920-1929) Then, despite a brief recovery, the market and the Dow continued to slide until the Dow reached 41.22 in July of 1932. (Wikipedia Wall Street Crash of 1929) A huge number of wealthy investors were wiped out during this period but some regrouped, learned from their mistakes, and moved on to create safer and more profitable ways to invest. One who stands out from this era is Benjamin Graham. It was in the aftermath of the stock market crash and during the dark days of the Great Depression that Benjamin Graham introduced the idea of value investing in Security Analysis, a book he coauthored with David Dodd and with help from Irving Kahn. In the book he wrote about intrinsic value, margin of safety, and the fundamental analysis of stocks instead of buying on sheer speculation. The revolutionary idea that Graham taught was that the intrinsic value of a stock was totally independent from its market price. In Security Analysis the authors argued that an investor could determine the intrinsic or real value of a stock by looking at factors like the company’s assets, earnings, and dividends paid. These would indicate the ability of the company to make money over the coming years which would in turn determine the eventual market value of the stock. The point was to estimate a company’s future cash flow based on analysis of past and current performance as well as current assets and business plan. Graham believed in efficient markets. Despite the frequent irrationality of investors in bidding up stock prices based on greed or letting them fall in fits of panic, the price of a stock eventually moves toward its true value. Graham taught that investors should calculate the intrinsic or true value of a stock and then compare it with the current stock price. When the current price of the stock is less than the intrinsic value the investor should buy. And when price of the stock is more than the real or intrinsic value he should sell or avoid the stock. The mean reversion is the belief that over time the intrinsic value of a stock and its market price will converge. This will happen in periods of market efficiency. Graham was not just a theorist who lectured at Colombia Business School in New York. He was a successful investor in his twenties making as much as $500,000 a year! He was also wiped out, like other investors, in the stock market crash. It was from his own experiences that many of his ideas and his later success emerged. And one of these ideas was that markets may overvalue a stock or undervalue a stock but markets will eventually find the correct or rational price which will be the intrinsic value of the stock. Graham’s concept of intrinsic value was not just based on expected cash flow but also on the stability and financial security of a company. Businesses with assets like factories as well as cash in the bank instead of a lot of debt have a margin of safety. Likewise, a company with a strong and well-known brand name is likely to do better during economic downturns and be better positioned to rise again as the economy improves. Such stocks will make money year in and year out and have increased intrinsic value. The dictionary defines intrinsic stock value as its fundamental value. Add up predicted future income of a stock and subtract the current market price. In looking for the true value of a stock instead of its book value or market value one uses fundamental analysis which is another idea that came out of Graham’s work. Using fundamental analysis one can say that intrinsic value is the expected cash flow of a business discounted to current dollars, a discounted cash flow valuation. The problem in applying an intrinsic value calculation to a stock is that all too often the medium and long-term prospects of a company and its earnings are not clear. None other than a student of Graham and one of the most successful investors ever, Warren Buffett, has said that he throws out the vast majority of possible investments as too difficult to call! To make the intrinsic stock value concept work in the real world investors need to have a clear idea of how a company makes its money and how that business plan will continue to work. In doing this the investor looks at how a company manages its assets, the viability of its products and services, its R&D, marketing, and competitors. After writing about the concept for years, Graham provided a formula in 1962 and updated it in 1972. Here is the original 1962 formula for calculating intrinsic stock value. Here is the 1974 revision. In 1962 the average yield of high grade (risk free) corporate bonds was 4.4%. Y was to be the current yield of AAA corporate bonds. Graham’s 1949 book, The Intelligent Investor: The Definitive Guide to Value Investing is an investor’s Bible. In it he says that the intelligent investor buys from pessimists and sells to optimists. Because the smart investor has done his or her homework this investor knows the true value of a stock which is the value that the market will eventually arrive at via mean reversion. The “V” for intrinsic stock value is used to find the Relative Graham Value or RGV. Simply divide the intrinsic value of a stock by its current market price. This is the RGV. An RGV of less than one means that the stock is currently overpriced and should be avoided or should be sold if it is in the investor’s portfolio. An RGV of greater than one is indicative of an undervalued stock for which the market has not yet caught on. This is a stock to buy and hold at least until the mean reversion occurs and the market price catches up with the intrinsic value of the stock. An ideal investment is one that makes money and allows you to sleep soundly at night. Calculating intrinsic value helps on both counts. But market can be irrational in both up and down directions. As such a stock that is undervalued and a buy according to intrinsic value could become an overvalued stock when market euphoria drives the price up beyond where fundamentals would support the price. Even long term buy and hold investors need to pay attention to the well-chosen stocks in their portfolio to make sure that they still are good investments based on their intrinsic value. Does Intrinsic Stock Value Work for Every Stock? The answer to this question comes from Mr. Graham’s famous student, Mr. Buffett. Warren Buffett and his long term partner in picking investments, Charlie Munger, say that about five percent of the time they can reliably pick a winner using this approach and the rest of the time they simply throw out the possible investments as too difficult to call! 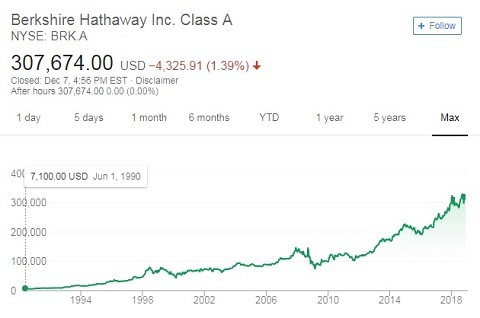 A good example of how applying an intrinsic value approach works in investing, look at how well Buffett’s company, Berkshire Hathaway has done over the last 28 years. The stock has appreciated from $7,000 a share to $307,000 a share over that time. Intrinsic stock value is a valuable tool for smart investors. Using it requires work and attention to detail. And, by using it, investors typically make more money and sleep better too!